Located 20 miles north of Savannah, Georgia, Hilton Head Island is a popular resort destination in South Carolina and a more upscale alternative to Myrtle Beach. Keeping the little ones occupied while visiting Hilton Head won't be a problem for concerned parents. There are a vast number of kid-friendly activities including gator farms, children's museums, sports camps, and ice-cream parlors galore. With over 12 miles of sandy shore to explore, it's no wonder beach-loving families love Hilton Head. Favorite public beaches include Coligny Beach Park with access off Coligny Circle, Driessen Beach Park with access at the end of Bradley Beach Road, and Folly Field Beach Park with access off Folly Field Road. While the island's beaches are public, access is often limited. The solution is to choose a resort with beach access, which can also help in avoiding the crowds. Take a cruise with the Island Explorer, and you'll see plenty of dolphins frolicking in the water as well as herons and other wildlife. The company offers personalized dolphin and nature eco-tours specializing in groups of 12 or fewer, so it's perfect for families. Spending all day on the boat might be too much for the kids, so the tour options include a one-hour, two-hour, and three-hour ride, plus a sunset cruise on Calibogue Sound. 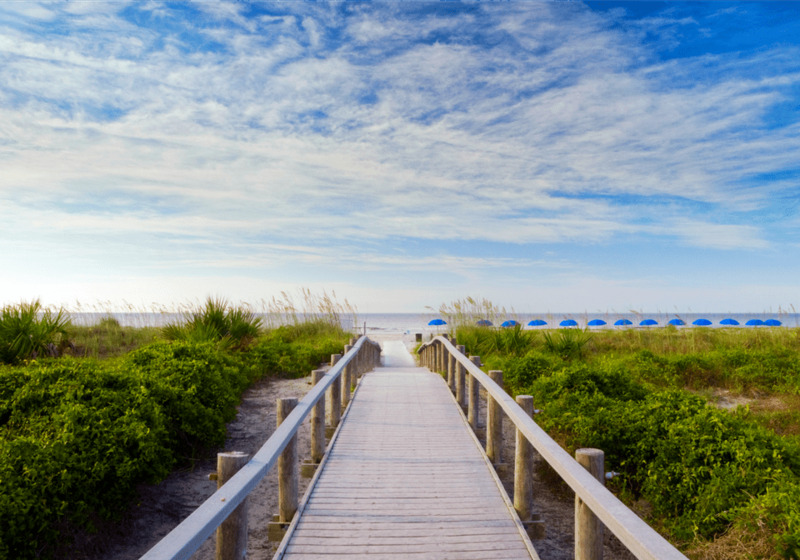 There are easy, flat, and paved bike paths that criss-cross the expansive Palmetto Dunes Oceanfront Resort, and takes riders under the namesake palmettos to the beach, over wooden bridges, past golf courses, and along the lagoon waterfront. You can rent bikes for the whole family from Hilton Head Outfitters. The shop offers beach cruisers, tandem bikes, and kids bikes for rent by the hour, 1/2 day, full day, and month. Even preschoolers will be able to manage the 114 steps to the top of the 90-foot-tall Harbour Town Lighthouse, one of the most beloved landmarks on Hilton Head Island. The lighthouse is the focal point of Harbour Town's waterfront enclave of shops and restaurants, which allows for a tasty meal after working up an appetite. Note: Harbour Town is located inside the gated Sea Pines Resort, which requires a day pass to visit. Bring your nature-loving kids to the Coastal Discovery Center, which offers hands-on and informative animal "meet and greets," with alligators, a butterfly exhibit, scavenger hunts, and tons programs to learn about Low Country wildlife across the 68-acres. The Center hosts a rotating set of hands-on activities during the year, including marsh, horse, plant, and blue crab tours. Check the calendar for specific timing. If teaching the kids about history appeals, there is an itinerary that explores the roots of the reconstruction era by visiting nearby Fort Howell and the town of Mitchelville, both important locations connected to the Civil War. Hilton Head is filled with several fantastic ice cream shops, but none is more beloved than Hilton Head Ice Cream. The island's first micro-creamery has been serving delicious homemade ice cream since 1982. Fans of the sweet treat have a choice of over three unique dozen flavors, like Mocha Pecan, Candy Cane, Toasted Coconut, and Birthday Cake. The kids will love the colorful decor and life-size pirate dummy hanging from a rope. Ranked number three in the world by Tennis Resorts Online for its junior tennis programs, Palmetto Dunes Tennis Center provides lessons to kids as young as four from March through Labor Day, and over the holidays. Sessions are tailored specifically to the player's interests, ability level, and schedule, with options such as the Short Shot Clinic, Super Shots Clinic, Junior Grand Slam, Junior Stroke of the Day, and more. The adult program is fantastic, too. If tennis isn't the sport of choice for your youngster, the site also provides lessons in golf and fishing. Toddlers and preschoolers will have a ball checking out the hands-on fun at The Sandbox, an interactive children's museum with plenty of role-playing and dress-up exhibits designed for kids six and under. Highlights include a construction zone, kitchen, pirate ship, climbing wall, and spaceship. During the summer, The Sandbox holds a weekly camp, teaching children art and related educational activities that culminate in an original craft for them to take back home. Get up close and personal with nature on a scenic ride through an 11-mile inland lagoon system at Palmetto Dunes. Along the way, you may spy herons, egrets, turtles, and maybe even an alligator. The calm waters of the lagoon make it ideal for beginners. A variety of kayaks and canoes is available from Hilton Head Outfitters. Note: The minimum age to use a kayak or canoes is five years old. If your family is addicted to golf, you're spoiled for choice on Hilton Head, ranked number 10 on Golf Digest's list of the world's best golf destinations. You'll find world-class quality courses, both public and private, with a variety of experiences including oceanfront and parkland courses, and championship courses designed by notable golf architects including Robert Trent Jones Sr., Pete Dye, and Jack Nicklaus. At Palmetto Dunes Oceanfront Resort, kids can learn to play at one of the resort’s three golf courses through the Little Swingers program for ages four–seven. The Palmetto Dunes Golf Academy also offers a variety of junior instructional programs older children, and families can learn the sport of golf together as part of Family Golf School. Additionally, kids younger than 10 play golf free after 4 p.m. at all three courses when accompanied by a parent paying the standard rate. The Robert Trent Jones course also offers permanent junior tees, and the George Fazio course has markings of 150 yards or less.